In India, government-provided medical programs are insufficient to meet the needs of the enormous population, and too often medical care is available only to those who can pay for it. 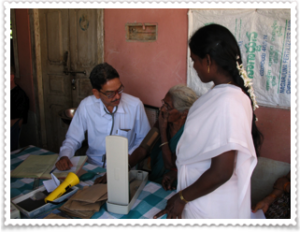 FOCI has helped to meet the need for decent medical care for those in need in the Khammam region. FOCI has helped support the redevelopment of St. Mary’s Hospital, a 100 year old mission hospital serving the poor of Khammam district. We have helped recruit new doctors, train nurses and improve the facilities. FOCI funds help pay for medical care for the poor, either at St. Mary’s or, if necessary, at other hospitals in Khammam. 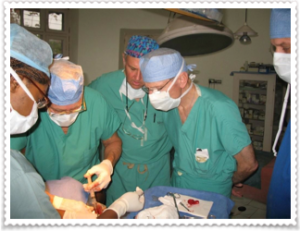 Each January, Dr. George Longstreth, surgeon and FOCI board member, leads a group of physicians and surgeons to St. Mary’s Mission Hospital in Khammam to conduct a free medical/surgical camp. Learn more about their most recent camp, by clicking here! 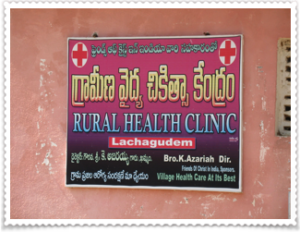 Since 2007, FOCI has sponsored Rural Health Clinics in four villages in the Khammam area. These are villages with no conventional medical clinic or doctor, and the population is largely agricultural laborers who work for day wages of about 25 Rupees, which equates to an annual income of approximately $200 per year. These very poor people rarely seek medical help, even for serious illness, because to do so requires them to travel to another town which not only depletes the little money they have, but also reduces their income for the time they do not work. The program pays a nurse to live in each of the villages and sends a doctor to conduct a clinic one day each week. Commonly prescribed medications are taken to the weekly clinic and dispensed at little or no charge based on the doctor’s orders. Seriously ill patients are referred to specialists or a hospital in larger cities, with financial help from FOCI if necessary. The live-in nurse is available to monitor medication usage, treat minor injuries, provide assistance and advice for pregnant women, and to telephone the doctor or hospital should there be an emergency situation. This program is already making a significant inroad on the diagnosis and treatment of diabetes and hypertension, both of which effect large numbers of the population, and which are debilitating if left untreated.